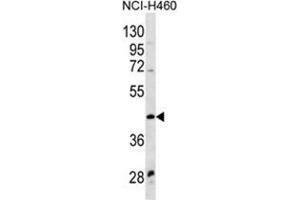 WNT9A Antibody (Center) western blot analysis in NCI-H460 cell line lysates (35 µg/lane). This demonstrates the WNT9A antibody detected the WNT9A protein (arrow). 特异性 This antibody detects WNT9A (Center). 储存方法 Store at 2 - 8 °C for up to six months or (in aliquots) at -20 °C for longer.